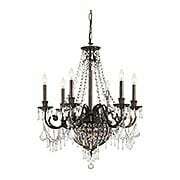 Create a stunning centerpiece with one of our authentically reproduced vintage chandeliers. 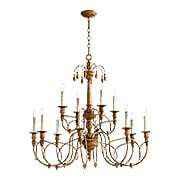 Classic antique chandeliers have been faithfully recreated here and improved with updated wiring. Interested in a specific design period? Use the menu below to browse by style. This colonial revival chandelier is as light and airy as a spider web. 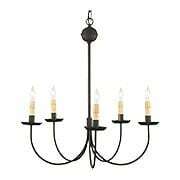 Made of slender steel rods, this primitive fixture is authentic and understated in style. Dripping candle sleeves, tin pie-crust cups, and a textured black finish complete the old-world look. Handcrafted in Pennsylvania. 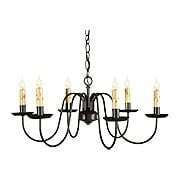 The Flanders 8-Light Chandelier displays old-world sensibility. 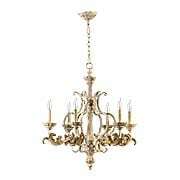 Dressed in a rustic, textured finish, it features an intricate structure and classic fleurs-de-lis throughout. It is equally at home in a stately, European chateau as the proverbial castle of your own. 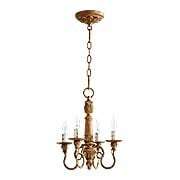 Handcrafted in Pennsylvania, this light and airy chandelier is the epitome of colonial elegance. 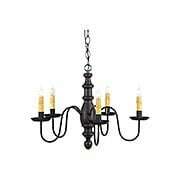 Formed from slender steel rods, it features dripping candles, crimped tin drip cups, and a satin black finish. 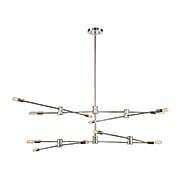 Only 10 1/2" high, it's suited for close-to-ceiling mounting in your living room as well as suspended over a dining table. 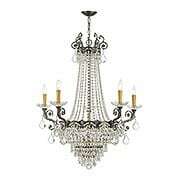 The Sirena 5-Light Chandelier exudes European sophistication. Detailed with classically inspired natural elements, the outer frame, inlaid with kabibe shells, captures a fluid, wavelike pattern. Its tapered center column seamlessly transitions to curved candelabra arms, with kabibe bobeshes beneath its oyster-organza drum shade. 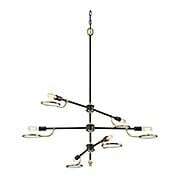 The Country Inn chandelier is scaled to suit a small dining room or breakfast nook. The shapely wood column is offered in an array of period colors, from plantation red to pearwood, each heavily textured and distressed for an authentic look. Arms and crimped tin pans are finished with a rustic black paint, making this a favorite for colonial style homes. Handcrafted in Pennsylvania. True to its Art Nouveau roots, the Monterey Collection is a display of organic influence. The simple design of this chandelier features climbing tendrils topped with vintage style dripping candles and a rustic finish. It is equally at home in a contemporary home as a mountain lodge. The Salento 4-Light Chandelier celebrates influences of the southeastern border of Italy. Delicate, imperfectly curved arms appear to bear the weight of its candlestick-styled light, while a leaf motif and asymmetry pay homage to baroque and rococo influences. At home in both traditional and contemporary interiors, it is suited for your dining room, entry, or bedroom. 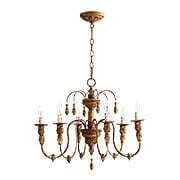 The Salento Decorative 27-Inch 6-Light Chandelier celebrates influences of the southeastern border of Italy. Delicate, imperfectly curved arms appear to bear the weight of its candlestick-styled light, while a leaf motif and asymmetry pay homage to baroque and rococo influences. 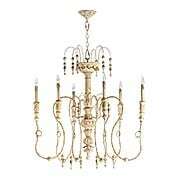 At home in both traditional and contemporary interiors, it is suited for your dining room, foyer, or bedroom. The Salento Decorative 8-Light Chandelier celebrates influences of the southeastern border of Italy. Delicate, imperfectly curved arms appear to bear the weight of its candlestick-styled light, while a leaf motif and asymmetry pay homage to baroque and rococo influences. 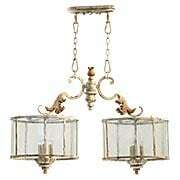 At home in both traditional and contemporary interiors, it is suited for your dining room, foyer, or bedroom. 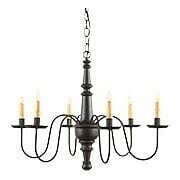 Blending painted wood and blackened tin, this six arm chandelier is a fine example of Early American style lighting. The shapely turned column features a heavily textured and distressed finish, which ranges in color from deep plantation red to buttery pearwood. Candle arms and crimped tin pans are finished with rustic black paint. Handcrafted in Pennsylvania. 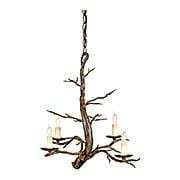 Bring a touch of woodland to your home with the Treetop chandelier. 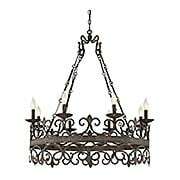 This rustic, yet refined fixture features a wrought-iron frame, an old-iron finish, and cream candle covers. Its simplified and realistic form is detailed, yet minimally finished, allowing the beauty of this nature-inspired piece to truly shine. 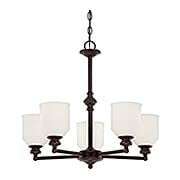 This Holbrook 5 light chandelier is a study in old-world simplicity. 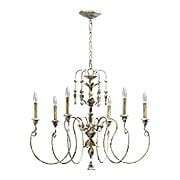 Made of steel, but convincingly faux finished to resemble wood & iron, it suits a variety of styles, from Early American to romantic European. With it's "walnut" column and graceful "iron" arms, the look is mellow, yet airy - perfect for your dining room, living room or bedroom. This colonial revival chandelier is as light and airy as a spider web. 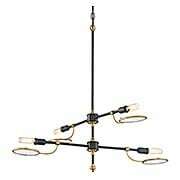 Made of slender steel rods, this primitive fixture is authentic and understated in style. Dripping candle sleeves, tin piie-crust cups, and a textured black finish complete the old-world look. Handcrafted in Pennsylvania. 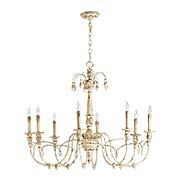 Inspired by fixtures from the early 20th-century, the Melrose 5-Light Chandelier suits a wide range of homes, from Colonial-Revival to Arts & Crafts. 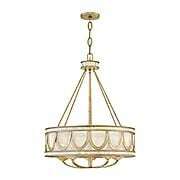 Straightforward yet shapely, this traditional design offers classic turned details and an opal etched-glass shades. Suited to modern interiors, the Lyrique 6-Light Chandelier offers an airy, structured look. Adjustable arms let you customize the configuration, while your choice of two finish options make it easy to match your decor. 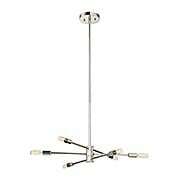 Can easily be mounted onto a sloped ceiling. Suited to modern interiors, the Lyrique 12-Light Chandelier offers an airy, structured look. Adjustable arms let you customize the configuration, while your choice of two finish options make it easy to match your decor. Can easily be mounted onto a sloped ceiling. Suited for a variety of interiors, our Oberyn 6-Light Chandelier features a fresh look with vintage influences. Minimal in design, its lenses of clear-seedy glass protrude from curved arms located beneath open sockets, perfect for Edison-style bulbs (not included). 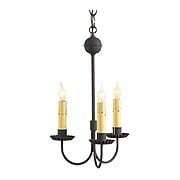 Finished in vintage black and warm, brass accents, it is sure to attract attention. 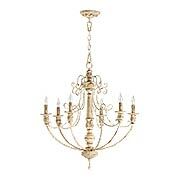 The Palermo 32-Inch 6-Light Chandelier celebrates influences of the southeastern border of Italy. Delicate, imperfectly curved arms appear to bear the weight of its candlestick-styled light, while a leaf motif and asymmetry pay homage to baroque and rococo influences. At home in both traditional and contemporary interiors, it is suited for your dining room, foyer, or bedroom. 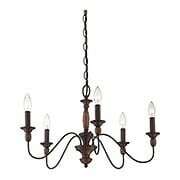 The Florence 6-Light Chandelier adds soft sophistication to your home. Each candlelight sits upon a classic bobeche wrapped in intricate leaf designs and finished in a rustic, Persian-white. This distinctive design befits a variety of interiors. The Salento Decorative 12-Light Chandelier celebrates influences of the southeastern border of Italy. Delicate, imperfectly curved arms appear to bear the weight of its candlestick-styled light, while a leaf motif and asymmetry pay homage to baroque and rococo influences. At home in both traditional and contemporary interiors, it is suited for your dining room, foyer, or bedroom. The Palermo 6-Light Chandelier celebrates influences of the southeastern border of Italy. Delicate, curved arms hold candlestick-styled lights, while a leaf motif and asymmetry pay homage to baroque and rococo influences. At home in both traditional and contemporary interiors, it is suited for your dining room, foyer, or bedroom. The Palermo 9-Light Chandelier celebrates influences of the southeastern border of Italy. Delicate, curved arms hold candlestick-styled lights, while a leaf motif and asymmetry pay homage to baroque and rococo influences. 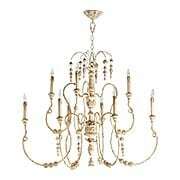 At home in both traditional and contemporary interiors, it is suited for your dining room, foyer, or bedroom. Bold and geometric, this striking art glass fixture recalls Frank Lloyd Wright's Prairie glass panels of the early 20th century. 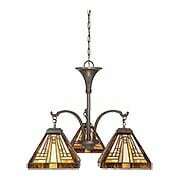 A classic Arts & Crafts piece, it features handcrafted art glass in warm shades of amber, bisque and earthy green. What a dramatic accent to any vintage or contemporary interior! 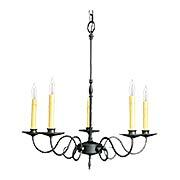 Inspired by French iron fixtures of the late 19th century, this 6 Arm Chandelier offers the ultimate in European elegance. 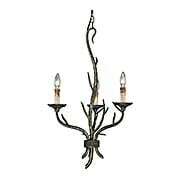 The intricate cast iron elements are finished with an antique bronze patina and draped with brilliant lead crystals of many sizes and shapes. Dazzling from any angle, these chandeliers, sconces and pendants are sure to be the focal point your decor.